“Know who you are, and tell the world.” That’s the prompt Sam Part had to answer as part of a design project at London’s Kingston University. He pondered what that meant for him and came to a reasonable answer: He was a likeable guy. But in his notes, Part wrote, “I’m a lickable guy.” That error, it turned out, was sweet inspiration. To complete his project, Part created something he called a Lolpop, a highly detailed 3D rendering of a person’s face—in chocolate lollipop form. That design later received a nomination for a D&AD New Blood Award, a renowned competition that recognizes the work of young creatives. Six months after that first Lolpop, Part and Ben Redford co-founded Candy Mechanics, but the work of getting Lolpops out into the world had only begun. Taking a classroom project and scaling it to meet real-world demand—that’s where ingenuity, and some unique tools, came into play. So the duo went back to the drawing board, considering vacuum-formed head/face molds. In this process, an object is first etched; then, a thin plastic lining is vacuum-sealed around it. The mold takes the shape of the original carved object, and chocolate is poured into the mold. It hardens into a 3D rendering in sweet confection form. That worked reasonably well, but they still weren’t satisfied. The candy team then eyed an unlikely device: a CNC machine, which is typically used with materials like wood and metal. Part wondered what it could do with chocolate—after all, chocolate, like wood, is soft enough to carve but hard enough to retain its shape if handled correctly. “Chocolate is a difficult product to work with,” says Will Leigh, Candy Mechanics’ confectionary director and former chief taster at British chocolate company Green & Blacks. “One of the key things to look at [when we began] was the drill speed. If this rotated too fast, it would melt the chocolate. In our testing phase, lots of things ended up covered in chocolate! Get the details on how to make your own Lolpop. When milling with a CNC machine, a precision drill is directed by a computer to move in one of three directions (up, down, and side to side), and these movements carve into a stationary object—in this case, a piece of chocolate. In theory, Part explains, you could use any CNC mill for his chocolate creations. “But our process has been optimized for chocolate by using certain tool types and carefully selected cutting profiles,” he says. Tests upon tests led to these just-right settings, and the company dubbed its customized machine the Candy Carve. While sorting out the best machine for their manufacturing needs, Part and his team also had to come up with a computerized system to convert customers’ faces and designs into unique pieces. They started experimenting with a variety of off-the-shelf-software. “The way that we are combining them, though, makes the process unique,” Part says. They also added custom software, leveraging Autodesk’s Forge API platform and Autodesk ReMake, which allows customers to upload short videos from their smartphones to the Candy Carve. The machine’s software creates a carve-worthy 3D image of the customer’s face from the video. “This is pretty amazing, as it makes Lolpops the world’s first customizable consumable product that can be created directly from a smartphone,” Part says. The customizable nature of its products helps Candy Mechanics stand above other tech-forward candy creations like screen-printed chocolate candies or stamped truffles. Since launching a small—and highly successful—trial for Lolpops in the popular British department store Selfridges in 2015, Candy Mechanics has seen significant growth. The company introduced a second product, Candy Cards, last year. Customers use an online app to create one-of-a-kind designs. The Candy Carve machine etches the design, and the unique and delicious piece of art is shipped to a lucky recipient. 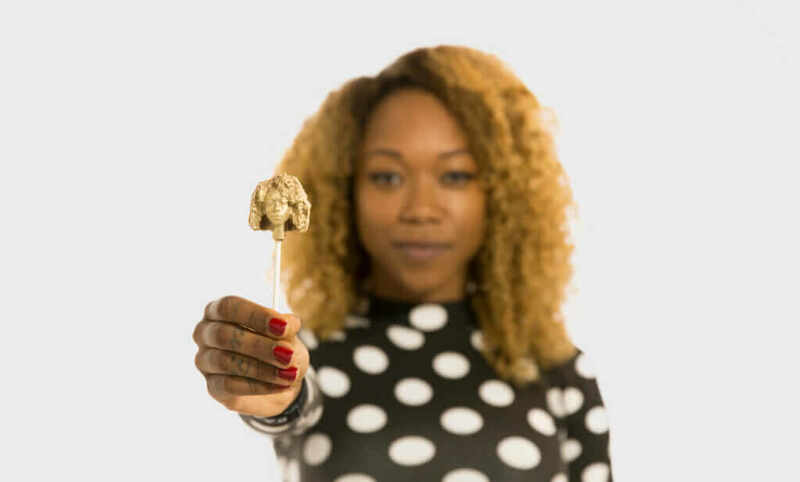 Candy Mechanics is also adding dark-chocolate options to its lineup, and if customers want a little more pizzazz in their Lolpops, their 3D faces can be dusted in sparkly, edible gold.